Jonathan Harker is an English lawyer traveling to Eastern Europe for a real estate transaction. His journey takes him to meet a nobleman, Count Dracula. During his journeys, villagers whisper warnings, and they pass along crucifixes and holy water while uttering words that mean vampire. Though fear enters his mind, Harker meets Count Dracula and finds him to be educated, hospitable and quite the gentlemen. Some time later, Harker finds he is a prisoner in the castle. He faces seduction by female vampires and other supernatural experiences. An attempted escape takes place as Harker tries to find his way back home. The story continues to intertwine tales of Harker’s fiance, Mina, and her friend Lucy who falls victim to a great tragedy. Will Mina suffer the same fate? What will become of Harker’s relationship with the Count? 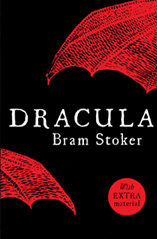 The answers can be found in this classic literary masterpiece that started the vampire phenomenon.